" Modern farming techniques have changed the way America produces food. The U.S. grows more corn than any other country on the planet. These modern farming techniques, combined with massive government subsidies, have turned corn into an incredibly productive — and incredibly cheap — crop. 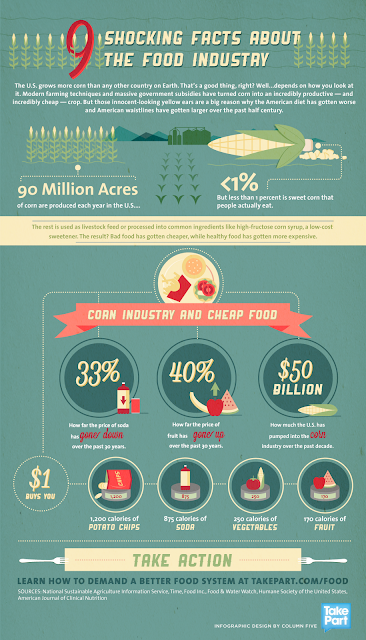 90 million acres of corn are farmed every year in the U.S., and 1% of that is sweet corn, the type people actually eat. So, what is the corn being produced and used for? To worsen the American diet and enlarge waistlines? The other 99% of corn being produced is used to feed livestock, or processed into common ingredients like high-fructose corn syrup, a low-cost sweetener. This has resulted in bad food becoming cheaper, while healthy food is getting more expensive. The price of soda, chips, and other snacks has gone down over the past 30 years, while the price of fruits and vegetables has gone up. The source of corns influence in our diets comes from the $500 billion Farm Bill, which Congress passes every few years. This legislation greatly influences what goes into our grocery stores, onto our plates and into our bodies." Let's just hope that Palm Oil doesn't share the same fate. Sad that this is happening. I suppose healthy and quality food comes with a price and as usual, we will have to pay more and more. Bad food has always been cheaper than healthy food because of its costs. There is always a price when it comes to health. Consumers are always at the losing end. I believe in the mindset that it’s either you pay more for healthier foods and lead a healthy life or spend more on your medical bills, which is why I try to go organic when my wallet allows me to. I totally get what you mean, sometimes I try to go organic as well, but I am a bit skeptical when I buy things which are labeled organic. Honestly, how would we know what we buy is truly organic? yea healthier means more costly.. even in malaysia, i think the organic and healthy food galore has very 'stunning' price tags..
You are right. I don't mind paying a premium for organic food but I'm worried that I'm just another victim of the mgkt scam. that is why my boss always say that he want to be a farmer to produce good organic vegetables..
good post smitten! the govt should regulate and abolish these big corps who are monopolizing the food we eat. there are a few documentaries devoted to this issue, Food Inc, King Corn, and As We Sow are some good ones. I heard about Food Inc, but I can find any free streaming on it. Will check out King Corn and As We Sow =) Thanks for the recommendation. What's worse is that much of that government subsidized grain is used for force feeding beef to make them big and fat and unhealthy quicker so that those in the 'lucky' countries can eat more unnecessary protein, while taking that same amount of grain that is used to force feed the cattle could feed millions in the form of grain, rather than a few rich in the form of meat! If all of us omnivores went meatless for just one meal a week it would make a huge difference. We have to use our power as consumers to change the industry. Industry produces what we demand.